Welcome to the Department of Mathematics at Tarleton State University! Our Mission and Purpose is to provide empowering educational opportunities that prepare students for rewarding careers as collaborative leaders in their chosen fields and contribute to the development of a mathematically literate citizenry. Welcome to the Department of Mathematics at Tarleton State University. I hope you will find our website helpful and informative. Our department’s main goal is to help students excel in the fields of Mathematics and Mathematics Education. We have highly qualified faculty members in different areas in pure and Applied Mathematics, Statistics, and Mathematics Education. Whether you are taking one course as a university requirement or pursuing a degree in Mathematics, our faculty’s dedication to upholding high teaching standards will provide you with a rich, knowledge-filled experience. We are located at the Mathematics Building. Come by and check out our facility classrooms and computer lab. If you would like further information, please feel free to call us at 254-968-9168. Every semester our program sees a number of our students off to graduation. Our graduates range from undergraduate to graduate degrees. Many go on to have successful careers and we're proud of the work they do. We believe they show the range of career possibilities for those with an interest in Mathematics. Earn a Master of Science in Mathematics, specializing in data science, mathematics education, pure mathematics, or applied mathematics. On April 18, 2019, the College of Science and Technology held its annual Awards and Showcase. The event featured faculty award presentations, student research showcase awards, and staff appreciation gifts. Dr. Scott Cook of the Mathematics Department received the Faculty Excellence in Student Success Award for his work in mentoring students and working with the Tarleton Math Club. At conferences this academic year, Tarleton math students have given 29 talks, made 15 poster presentations, and received six awards. Congratulations to Dr. Cook and the students! Congratulations to Dr. Keith Emmert on his promotion, announced April 11, 2019, to full professor. Dr. Emmert has served as President of the Faculty Senate, 2016-2018, and is currently serving on the Presidential Search Committee. The Mathematics department is looking to hire an enthusiastic and self-motivated student worker for an office aide position in our main office. You will work closely with the Mathematics faculty and staff to ensure a smooth and successful semester. Tarleton Math Department student and faculty groups went to Chamberlin Elementary School in Stephenville and to Lakeside Baptist Academy in Granbury to work with students in mathematics activities. These activities included subtraction and addition with cards, and creating figures with tangrams. Here are some pictures from a day of learning and fun. Dr. Scott Cook of the Mathematics Department and Dr. Thomas Faulkenberry of the Department of Psychological Sciences have been awarded a grant to lead the summer Computational Mathematics Program at Tarleton. This article in Tarleton Media Relations contains the press release from February 27, 2019, and further information about their upcoming work with minority undergraduate students. Jaryd Domine and Preston Ward earned positive scores and placed in the 53rd percentile nationally. This placed the Tarleton team in the 43rd percentile nationally, an outstanding result, given the legendary difficulty of the exam. Please join us in congratulating these four intrepid students. The 99th Annual Meeting of the Mathematical Association of America Texas Section was held March 28-30, 2019, and hosted by Tarleton State University. Highlights of the meeting included keynote addresses by Dr. Ed Burger, President of Southwestern University, and by Dr. Eli Luberoff, CEO of Desmos. There was a Math vs. Gerrymandering Workshop, and a Math Bowl competition for teams from around the state. For more information, see the Tarleton Conference Web Site. Dr. Eileen Faulkenberry served as this year's Local Arrangements Chair. Mr. Michael Warren served as Student Activities Chair, and led the Math Bowl competition on Thursday evening. Dr. Eileen Faulkenberry received the Ron Barnes Distinguished Service to Students Award. Dr. Bryant Wyatt, MAA Texas Section Distinguished Teacher 2018, presented an invited address "Thor onto Democritus: A Topological Isomorphism on Atoms and the Void." Nicholas Petela, Jaryd Domine; advisor Dr. Scott Cook, "A toy Problem and its Twisted Solution"
Hakiem Grant, Wyatt Young, Jaryd Domine; advisor Dr. Bryant Wyatt, "N-body Adaptive Optimization of Lattice Towers"
David Kiker, Shey Andrews, Michaela Aguirre; advisors Dr. Dustin Edwards, Dr. Keith Emmert, "Parameter Estimation and Simulation of Bacteriophage Infection Model"
The 31st International Conference on Technology in Collegiate Mathematics was held in Scottsdale, Arizona. Attending, Dr. John Gresham; attending and presenting papers were faculty members Dr. Scott Cook, Dr. Bryant Wyatt, Dr. Peter White, Dr. Chris Cox, and graduate student Tu Nguyen. Tarleton State University Department of Mathematics had the largest number of registrants from any university or community college. The Tarleton State University Math Club, led by Dr. Scott Cook and Dr. Bryant Wyatt, took three students to present talks at the Texas Academy of Science Conference March 1-2, 2019, held at Howard Payne University in Brownwood, Texas. Dr. Bryant Wyatt presented "Creating a Heliocentric Lunar Forming Impact Model." Preston Ward won 1st place in the Mathematics & Computer Science section, presenting "Math vs. Gerrymandering." Wyatt Young took 1st place in the Physics and Engineering section, presenting "Evolutionary Algorithm Optimization of Lattice Towers." Dr. Eileen Faulkenberry, Dr. Kathy Smith, and graduate teaching assistant Hannah Grant attended the 46th annual conference of the Research Council on Mathematics Learning, held in Charlotte, North Carolina, February 28-March 2, 2019. Ms. Grant and Dr. Faulkenberry presented their research on "The Impact of Reflection on Developmental Mathematics Students." RCML is a national organization that is a professional community of researchers in mathematics education who value collaboration and interdisciplinary research interests that seek to understand or influence factors that affect mathematics learning. 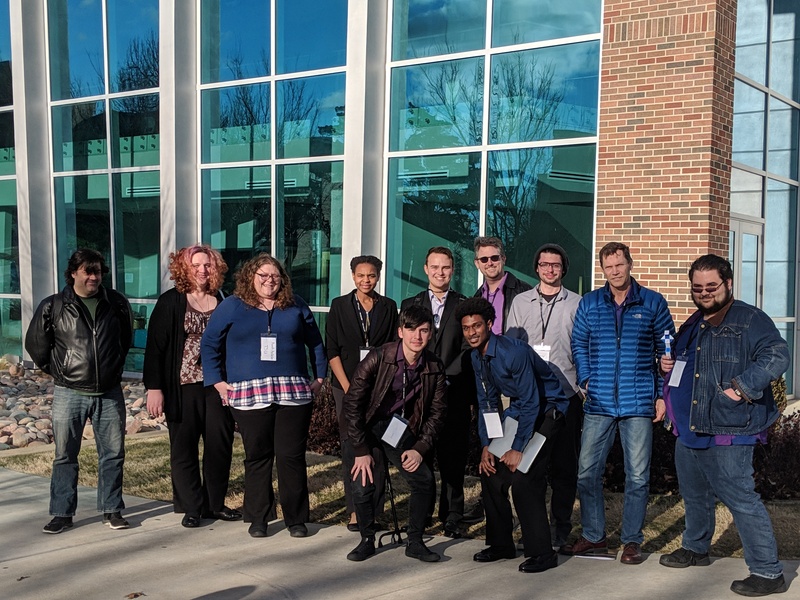 The Tarleton State University Math Club took 10 students to present 5 research talks at the Texas/Oklahoma Regional Undergraduate Symposium February 23, 2019, at Southern Nazarene University in Bethany, Oklahoma. They also took 3rd place in the Math Jeopardy. They made us proud! Thanksto the Office of Research and Innovation and the College of Science and Technology for funding this event. View a photo of the conference attendees. Dr. Eileen Faulkenberry and Dr. Scott Cook attended the Joint AMS/MAA Mathematics Meeting in Baltimore, MD, January 16-19, 2019. They joined over 5800 other mathematicians from around the world in what has become the largest annual mathematics conference. Faculty from the Tarleton State University accompanied students to the Texas Undergraduate Mathematics Conference held in Nacogdoches, Texas, at Stephen F. Austin University, November 2-3, 2018. Dr. Eileen Faulkenberry, Dr. Christopher Cox, Dr. Jesse Crawford, and Dr. Bryant Wyatt accompanied 25 undergraduate students to the conference where 10 students presented their research. Math majors Preston Ward and Maria (Suzy) Tovar won 1st place at the 2018 TAMUS Pathways to Research conference in the Social Science and Humanities undergraduate category for their talk "Math v. Gerrymandering" on Markov Chain Monte Carlo methods to fight gerrymandering. This is the group's second consecutive first place. They won 1st place at Pathways 2017 in the Mathematics undergraduate category for their poster "Transit Time Compactness." This new technique measures compactness of political districts via average travel times within the district. The group is led by Dr. Scott Cook of the Tarleton Dept. of Mathematics and also includes Casey Sutton, Diana Dinh-Andrus, Peter Hayes, Mary Barker, Joseph Brown, Dr. Rob Muth, and Dr. Anne Egelston. Thanks to Dr. Moon Duchin and the Tufts/Harvard/MIT Metric Geometry and Gerrymandering Group for allowing Preston Ward and Mary Barker to participate in their Voting Rights Data Institute in Boston, MA in summer 2018.